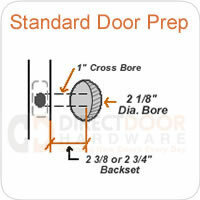 Specialty Door Hinges -- for all those hard-to-find applications. Are you looking for Hinges with Square & Round Corners? Double-Acting Hinges? Swing-Clear Hinges? They're all right here. Door hinges come in a huge variety of styles and finishes. If you can't find a door hinge for your application, please let us know and we'll do our best to find what you need. Can't find what you're looking for? Give us a call at 877-852-9449, we're always happy to help!